Video Shows Floor Collapse During Party at Texas Apt. 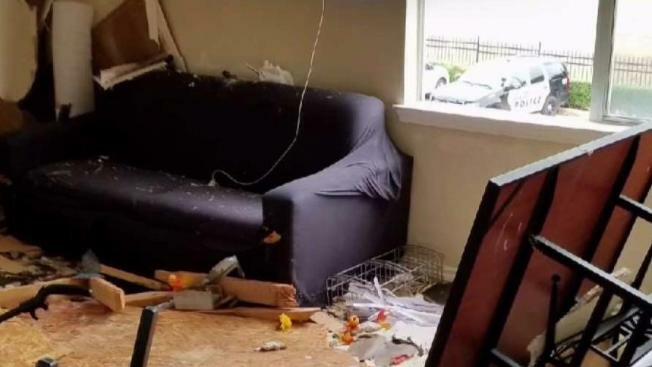 The floor of a Denton apartment unit collapsed during a party early Sunday morning, with video showing the cave-in that forced approximately 50 people out of their North Texas homes. Denton police said approximately 100 people were inside a third-floor unit at The Ridge at North Texas apartments when the floor collapsed. Between 10 and 12 people received minor injuries in the collapse, police said. Some people drove themselves to the hospital. The first 911 call regarding the collapse was made at 1:47 a.m. from the apartment complex in the 2700 block of Colorado Boulevard. The Denton fire marshal said there was a party and people at the party were jumping up and down when the floor collapsed onto the second floor. Pipes were broken and leaked into the second and first floors. Video of the incident showed people at the party jumping up and down before they fall to the floor below. Among those displaced are four young women who live directly beneath the apartment that collapsed. Moments before the collapse, two of the tenants drove to the police department to report the loud party that shook their home. "My door has never shaked [sic] before," Briceida Castro said. "And I knew at that moment that I had to leave. I told my roommate, 'We're leaving. Like right now.'" Castro, a student at the University of North Texas, took a picture of the overflowing crowd before driving away from the apartment complex. "I grabbed my keys, my wallet and I left to the police department," she said. Exactly four minutes after Castro and one of her roommates arrived at the police department, the fire department received an alert that fire alarms were going off at the apartments, according to time logs provided by the police department. "You can't, you really just can't. It's just ironic," said Castro, trying to make sense of what happened. Carley Carroll, a sophomore at UNT, also lives in the badly damaged unit. "It's just one of those, it's like it happened. It finally happened," she said. Carroll says she and her roommates have complained about the loud and large parties over the past three months. "This happens almost every weekend," she said. The complex advertises as "student-only housing," but it is a private facility and is not operated by the university, a UNT spokesperson said. Denton police tell NBC 5 that they never received any 911 calls to complain about the noise before the collapse. Police had previously been called to the unit on September 24 for a noise complaint. No one was being allowed back into Building One of the complex Sunday night. "Currently the building is completely shut down... until the apartment complex can get a structural engineer, and a construction crew out here to check the building out and certify that the entire building is safe," said Denton Fire Marshal Brad Lahart. Investigators are working to figure out what caused the structural failure. UNT says it has offered assistance to about 30 UNT students who live at The Ridge, including "access to short-term temporary housing, meals, and advocacy with faculty for any issues related to their classes or study" such as needing books or computer access. The four women who live in the apartment have a GoFundMe account set up to help replace their belongings destroyed during the collapse.